Mrs. Kelsey donates $10 to the Berry Schools. 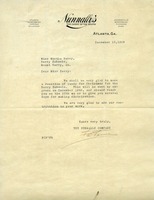 Ms. Fairchild wishes a Merry Christmas to Miss Berry and the schools and also sends $5 as a donation. 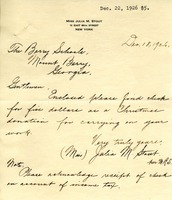 Julia M. Stout encloses a check for $5 as a Christmas donation to The Berry Schools. 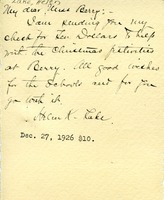 Ms. Lake donates $10 to Martha Berry and also sends well wishes for the holidays. 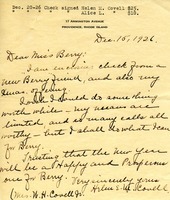 Letter from Helen E. M. Covell to Miss Berry, enclosing a $25 Christmas offering, as well as a $10 donation from a new "Berry" friend.